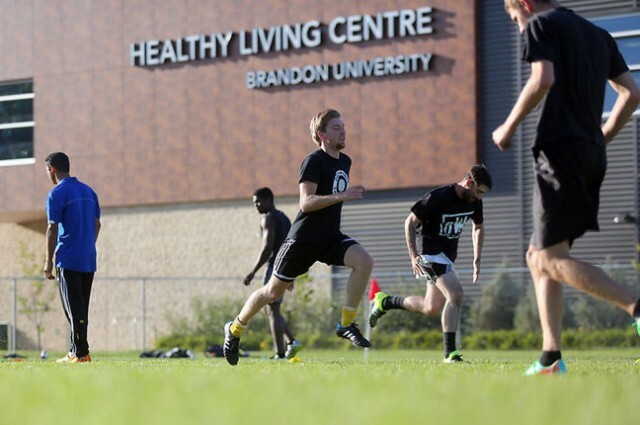 The Brandon University Bobcats men’s and women’s soccer teams enter their second season of Manitoba Colleges Athletics Conference play on the weekend with one giant difference. They now have a brand new soccer field on campus. The pitch, located south of the Healthy Living Centre and framed by 18th Street and Victoria Avenue, will host its first games on Sunday when Red River College visits. Men’s coach Terry McGonigle said the field is the culmination of a campus-wide effort to establish a pitch that involved everyone from president Gervan Fearon to athletic director Russ Paddock to the staff in the physical plant department. “They all came together and put a lot of effort in to make this happen so now we have got his good quality field,” McGonigle said. While the field has always been open for a variety of university intramural sports, the construction of the Healthy Living Centre created problems later when the pitch was being groomed. “The construction site was there so it had to be rehabilitated as grass was grown,” McGonigle said. Last season the teams played their home games at Vincent Massey High School. While soccer involves less equipment than many other sports, he said it is handier to be able to walk out of the gym to the field. And there’s also the fact that it’s convenient for people to walk over from the residence halls to watch. McGonigle adds that boosting the visibility of the soccer programs may also help with recruiting in the future. Soccer fields can vary tremendously in size; Schira said the one at Brandon University would be in the middle, although it’s definitely smaller than the pitch in Shilo where Assiniboine Community College teams plays. The ACC Cougars teams, in their third Manitoba Colleges Athletic Conference season, host the Providence Pilots on Saturday and the Canadian Mennonite Blazers on Sunday as they begin play. The Brandon teams meet at BU for the first time on Oct. 17. The Cougars men went 1-9 last season; the women were 0-6-2. There are no bleachers at Brandon University, but people are invited to bring a lawn chair and set it up inside the fence to take in a game. At least for now, use of the field will be restricted to the two Bobcat teams as their schedules stretch into late October. The men play 10 games and the women have eight scheduled. The BU teams entered the MCAC in 2014, with the men going 4-6 and the women finishing third at 4-2-2 and losing in the league semifinal. The teams open their seasons on Saturday in Winnipeg against Canadian Mennonite University, with Red River College visiting the new field on Sunday. The women play the very first game on the new pitch at 1 p.m., with the men following at 3:30 p.m.
WESTMAN TOUR: The Bobcat basketball and volleyball teams will play intrasquad games in gyms around Westman in the next couple of weeks. The women’s volleyball team will be in Souris on Sept. 16, the men’s basketball team will be in Glenboro on Sept. 17, the women’s basketball team will visit Hamiota on Sept. 22 and the men’s volleyball team plays at Gladstone on Sept. 23 … Brandon University also has men and women’s teams for futsal, which is five-on-five version of indoor soccer. Their season is from January to March.